I learned how to cook ham and beans (dry beans) starting the night before by rinsing and cleaning the dry beans. Then I cover the beans with fresh water and let them soak in the refrigerator overnight. In the morning I rinse them again and cover with fresh water. I chop a large onion in the pan and sometimes I add a chopped green pepper. This is when I like that ham bone to cook with the beans. If you don’t have the bone, then add some chunks of ham. A little ham fat is also very good for the seasoning if you don’t mind the extra fat. If you don’t have ham or bones, you can also use uncooked bacon for flavor. I also learned how to cook ham and beans using fresh green beans. Unlike the dried beans which need to be soaked and cooked for a long time, green beans do not require soaking. If using fresh green beans it does take time to pick the stems off, break and wash. If you choose to cook a pot of ham and beans with canned beans, all that is required is opening the cans and dumping in a pot with the ham. I usually add some chopped onion, salt and pepper to the pot. Because these canned beans are already cooked, it takes very little time until they are ready to eat. I also learned how to cook ham and beans by baking them. 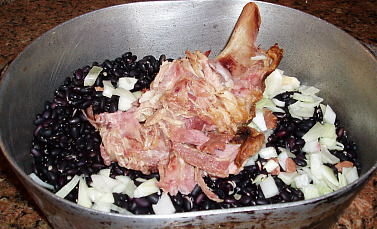 I usually cook a large pot of dried beans (Great Northern of a mixture) with the ham bone. (If you don’t want to cook dry beans you can use canned bean or canned pork and beans). Usually the next day or day after, I add chunks of ham, finely chopped onion, brown sugar and tomato ketchup until they taste like I want them to; sometimes I add chopped green bell pepper. After I pour the beans into a greased baking pan, I top the beans with strips of bacon. I then place them in the oven at 375F degrees for about 1 hour or so. These are so good and great for summer cook outs. Bring the beans to a boil, lower the heat and simmer for about 1 ½ hours or until the beans are very tender. If you choose not to soak the beans, it will take several hours for the beans to become tender enough. Brown bacon in a baking pot. Add the onion and brown. Add remaining ingredients and blend well. Cover with lid and bake for one hour. Heat fat in large skillet; add onion, jalapeno and green pepper. Cook over low heat about 5 minutes until vegetables are tender. Add grated cheese, Worcestershire sauce, salt, chili powder and cilantro; stir until cheese melts. Stir in beans and ham; cook and stir until thoroughly hot. Ham is also good to season green beans much like the dried beans. Start with fresh picked green beans. Wash in clean water and break each bean in pieces. Place in a large pot and cover with water. Add the ham bone or pieces of ham, a large chopped onion and a chopped green pepper. Cover beans with water and bring to a boil. Reduce heat and simmer until beans are very tender; 1-2 hours. 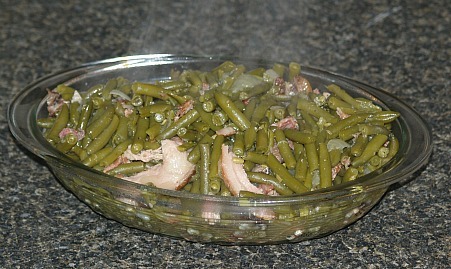 You can also cooked canned green beans with ham and it will not take as long to cook, but the flavor is not as good. Drain beans and reserve liquid; place beans in greased casserole baking dish. Heat fat over low heat; add flour and stir until well blended. Slowly add ½ Cup of liquid from beans; if needed add water to make ½ cup. Slowly add liquid to fat and flour mixture; cook and stir over low heat until thickened. Add brown sugar, salt, pepper, mustard and lemon juice; pour sauce over lima beans. Sprinkle top with buttered crumbs and grated cheese; arrange bacon on top if desired. Bake at 375F degrees for 35 to 35 minutes or until browned.